Encore is pleased to announce that all Encore products are compatible with the Dynamics GP 2018 R2 service pack update. A new build or registration keys are not required for this service pack update. If you are on an older Encore Product build for GP2018, when moving to GP2018 R2, it might be a good time to review the most recent features and functionality released since your last update, to determine if there is anything new that will benefit your company. Each product page will have its own external release build notes in the resources section so you can review what the latest build release is, and what updates have been added to the build. You can access each Encore Product page from our solutions page here. Microsoft Dynamics GP > Tools > Setup > System > Encore product registration. 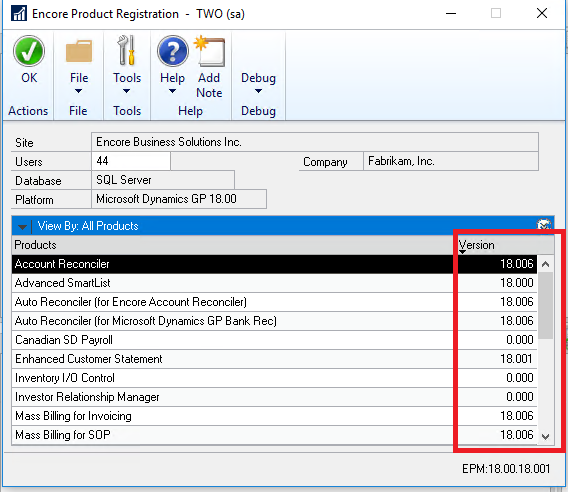 If you have any questions about Encore add-in products for Dynamics GP, please contact us. David has been working in the technology industry for almost 20 years. As a Technical Support Analyst at Encore, David works with clients to trouble shoot any issues they are experiencing with Encore Products. David’s inquisitive nature makes him a natural at drilling down to problems quickly as well as process improvement.